I suppose it's about time that I address this work. All of us here are undoubtedly well-familiar with this ugly, minimalist, droning record. In a way, this album is perhaps more fitting for the term "dungeon synth" than any I've reviewed so far, when we consider that not only does it sound exactly like one has been condemned to that damp, cold place, but it was in fact composed and performed by a person who was himself in a dungeon of sorts. These tracks are mostly spooky, an atmosphere of gloom, isolation, and despair, which is enhanced by the raw midi tones. Judging by the music alone, it still seems fascinating to me that this album could've become so well-known, due to the sheer simplicity and repetition. 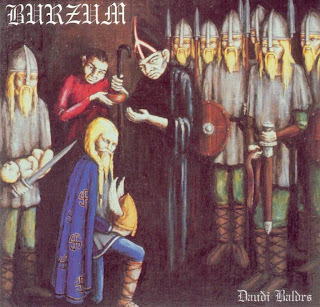 It is, of course, understandable, considering Burzum's general fame and the hype that was surrounding Varg at the time, and this album as well, being his first "prison album." In a way I'd say that the hype was a very good thing, because it allowed listeners to explore a very eccentric release that I think most would usually avoid judging on the music alone. Instead, people listened and attempted to understand, and though I personally do not know that there is too much to "get" here, it still played a powerful role in opening people's minds to what could be done with the dungeon mood. There are some quite magical moments mixed in with these trudges through desolation, such as Hermoðr á Helferð and Móti Ragnarǫkum. This work as a whole could best be described by the term "vampiric." I certainly don't mean that in the sense of the popular modern notion of vampires, of course, but more along the lines of what it symbolizes: the decayed aristocracy, a noble bloodline turned monstrous by the weight of time. I feel as if Varg most strongly falls into his persona as "Count Grisnakh" here, the title and blood of a high-born person but with the repugnance and innate evil of an orc. One can almost picture, especially during tracks such as Bálferð Baldrs and Í Heimr Heljar, a horrific tyrant, limping through a rotting castle, barking orders at subordinates, drunkenly attacking servants, or sometimes just screaming at empty air in his inbred madness. The mood becomes far more somber in Illa Tiðandi. It is a song filled with loss. It feels as if this is a more sober look at just how deeply this once-beautiful existence has been corrupted. It seems to have fully accepted the hopelessness, but there is beauty nonetheless, if only in a sort of dreamlike remembrance of what must've once been, though can be experienced no longer. The length of this track is the longest in the album, and I think for good reason, since I feel that it represents the sands of time blowing on, the long wait before life might return to the desert. It is a mood of not only loss, but acceptance, recognizing that night inevitably comes. And then there is the track which I feel is the highlight of the album, Móti Ragnarǫkum, which is the rebirth where the previous track was the death. It is grand and glorious; one sees the towers crumbling, the earth splitting asunder, fires raining from the heavens, and finally senses that the thorough rot is being washed away. 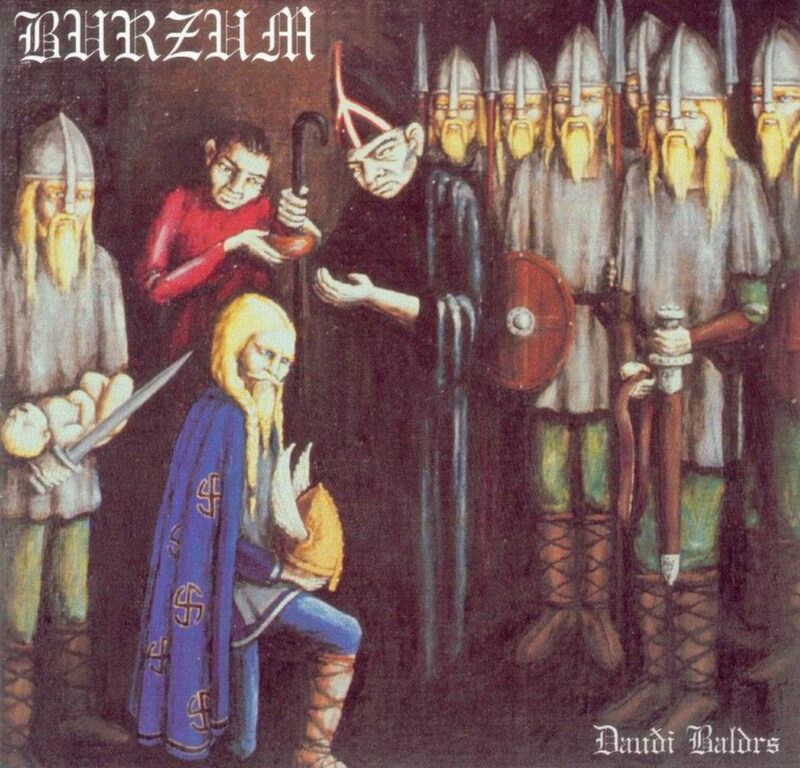 This track might even be the climax of all of Burzum's ambient material, that this decadent modernity which Varg so opposes finally meets its inevitable destruction, so that the life might begin anew without this debilitating disease. I'm sure many of you have come to this conclusion already, but for its surprising simplicity, this album is quite thought-provoking, and strangely elusive. I think you sould pay more attention to the lyrics for this album, the interpretation was too musically induced, incorrect in my opinion. The concept is actually quite limited and clear in the lyrics. I might've been personally limited in this review. I'm not a person who cares much about lyrics. If I can't understand them as I'm listening, then I don't usually bother looking them up, and basically treat them just as another instrument providing texture and melody. Generally this doesn't hold me back in dungeon synth, since lyrics are so sparse (and one could argue it doesn't hold me back here either, since technically the lyrics aren't a part of the music itself, and are completely supplemental). The supplemental text has never been a part of my listening experience with this album. I treated it as any other dungeon synth record, as a seed for personal visions and impressions. So, even though I knew about the supplemental text, I basically decided to review it from the same approach as my listening habits. Perhaps that's not "doing it justice," but I don't think authorial intent matters either, so I'm still pretty happy with this review. That's ok but I encourage you to give it a proper listen with the lyrics at hand, since it is a really nice experience. It puts things together nicely and poetically.